When director Sebastian Hartmann began creating a theatre production of Leo Tolstoy’s War and Peace, he reached out to his German brethren Sascha Ring aka Apparat to produce the original score. Locked in an abandoned factory for a month with a 30-piece ensemble, Apparat wrote and rehearsed eerie and exhilarating sounds to be performed in the theatre. Though the stunningly haunting tunes were not initially intended for release, Ring took the recordings into a studio after the final performance of the play. The result is a set of gorgeous symphonies for the world to enjoy. Apparat’s ability to create monstrous tension with subtleties is finally on full display, as the producer’s music has always been suited for an orchestra. 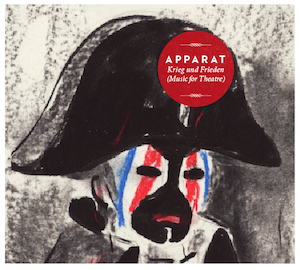 Life is a play starring you, and Apparat has created the ultimate score.